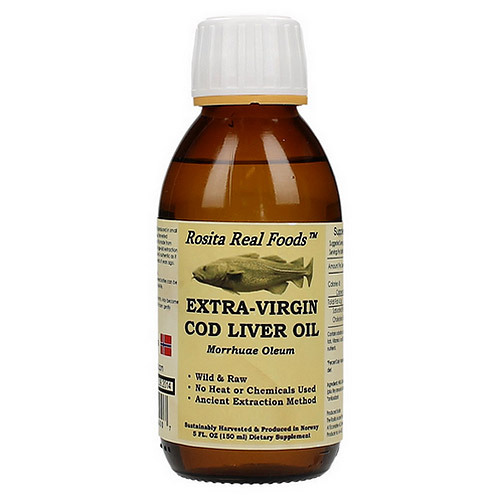 Rosita Real Foods Extra-Virgin Cod Liver Oil is real Norwegian cod liver oil. Fresh, raw and handcrafted from superior quality fresh livers through adapting an age-old extraction technique - using nature to separate the oil from its liver. No chemicals, solvents and mechanical devices are used during the extraction process. The oil is completely unrefined and produced under the total absence of heat, a process that protects the oil’s nutritional value. Rosita Real Foods is a small family run artisanal company born in the remote areas of Norway where wildlife is abundant, the air is clean and the waters are pure. Their goal is to produce genuine wild liver oils of the same quality that their ancestors the Nordic Vikings consumed. Wild Raw Cod Liver Oil, Rosemary, Full Spectrum Vitamin E.
½ to 1 teaspoon daily depending on your specific requirements. Once opened consume within 3 months. Always refrigerate. Unopened bottles can be stored in the freezer for improved shelf-life. May become thick and cloudy when refrigerated or frozen: gently shake before use. 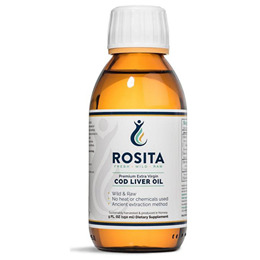 Below are reviews of Rosita Real Foods Extra-Virgin Cod Liver Oil - 150ml by bodykind customers. If you have tried this product we'd love to hear what you think so please leave a review. This was recommended by other parents and I am glad I invested in it. My little one tolerates it well and has been well this winter. Having used cod liver oil for years I was delighted to be able to taste the lightness and fresh flavour of this particular oil: the colour is also pale and the texture is very light too. A high price but you can taste the difference! Rosita Real Foods Extra-Virgin Cod Liver Oil is authentic Norwegian cod liver oil. Fresh, raw and handcrafted from superior quality fresh livers through adapting an age-old extraction technique - using nature to separate the oil from its liver.